Joel Bius’s new book, Smoke ‘Em If You Got ‘Em: The Rise and Fall of the Military Cigarette Ration, is a treatise on the relationship between the American Military-Industrial complex and the cigarette. Mark and Joel discuss the story of how the cigarette and the soldier relationship evolved, developed and devolved during the twentieth century—and the consequences. The American military-industrial complex and accompanying culture are most often associated with massive weapons procurement programs and advanced technologies. Images of supersonic bombers, strategic missiles, armor-plated tanks, nuclear submarines, and complex space systems clog our imagination. However, one aspect of the complex is not a weapon or even a machine, but one of the world’s most highly engineered consumer products: the manufactured cigarette. 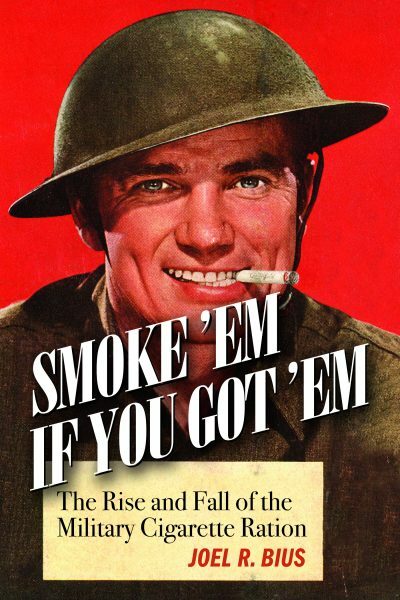 Smoke ‘Em If You Got ‘Em describes the origins of the often comfortable, yet increasingly controversial relationship among the military, the cigarette industry, and tobaccoland politicians during the twentieth century. After fostering the relationship between soldier and cigarette for more than five decades, the Department of Defense and fiscally minded legislators faced formidable political, cultural, economic, and internal challenges as they fought to unhinge the soldier-cigarette bond they had forged. Smoke ‘Em If You Got ‘Em is also a study in modern American political economy. Bureaucrats, soldiers, lobbyists, government executives, legislators, litigators, or anti-smoking activists all struggled over far-reaching policy issues involving the cigarette. The soldier-cigarette relationship established by the Army in World War I and broken apart in the mid-1980s underpinned one of the most prolific social, cultural, economic, and healthcare related developments in the twentieth century: the rise and proliferation of the American manufactured cigarette smoker and the powerful cigarette enterprise supporting them. From 1918 to 1986, the military established a powerful subculture of cigarette-smoking soldiers. The relationship was so rooted that, after the 1964 Surgeon General’s Report warned Americans that cigarettes were hazardous to health, a further 22 years were needed to advance military smoking cessation as official policy, and an additional 16 years to sever government subsidies providing soldiers low-cost cigarettes. The role of wars and the military in establishing and entrenching the American cigarette-smoking culture has often gone unrecognized. Using the manufactured cigarette as a vehicle to explore political economy and interactions between the military and American society, Joel R. Bius helps the reader understand this important, yet overlooked aspect of 20th century America.